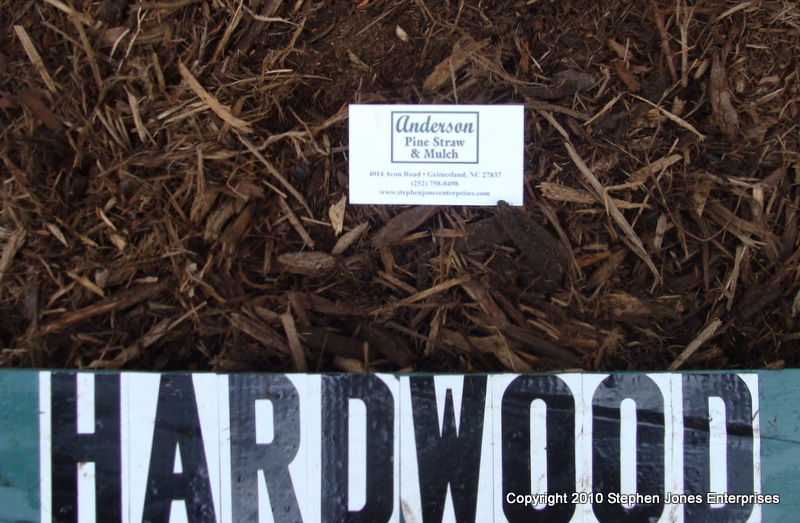 Hardwood mulch is composed of mostly oak with blends of other hardwoods. This product is triple shredded and our most coarse wood fiber mulch. This product provides excellent resistence for wind and water caused erosion. Brown in color and coarse in texture, it is excellent on slopes. The longer shredded wood fiber materials allow for compaction from foot traffic and will hold more moisture than any cypress product. This mulch is a natural color product. Of all our current wood fiber mulches this is the product with the least amount of wood fiber. This mulch is composed completely of pine and primarily of pine bark screenings. It is an excellent growing media for plants. This is our finest ground material with an average consistency of less than one-half of an inch. This is a natural color product that is excellent for annual beds, azaleas, camellias, roses and any areas that could benefit from a slightly acidic soil. This is an IPEMA certified product. IPEMA is an acronym for International Play Equipment Manufacturers Association. 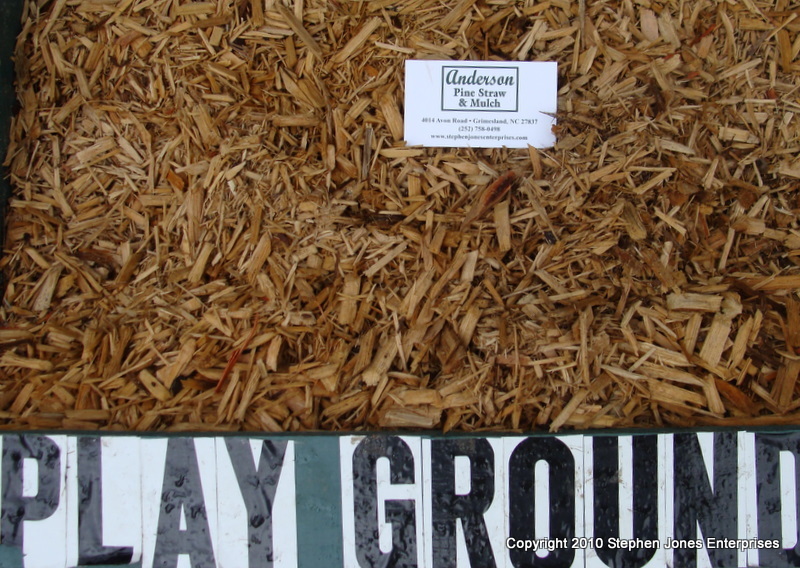 This mulch is excellent for children's play areas because this product has to be tested and inspected before it can be released for public use. It is a product that looks like natural cypress but has to be used for safety on playgrounds and for other public areas. Many people find the look attractive and is used for accent bedding and also for paths and walkways within garden areas. This product is popular with churches, schools, children's centers along with home play areas and landscaping needs. Chocolate cypress has quickly become one of our best sellers. It is a non-toxic dyed cypress product and dyed a chocolate brown color. 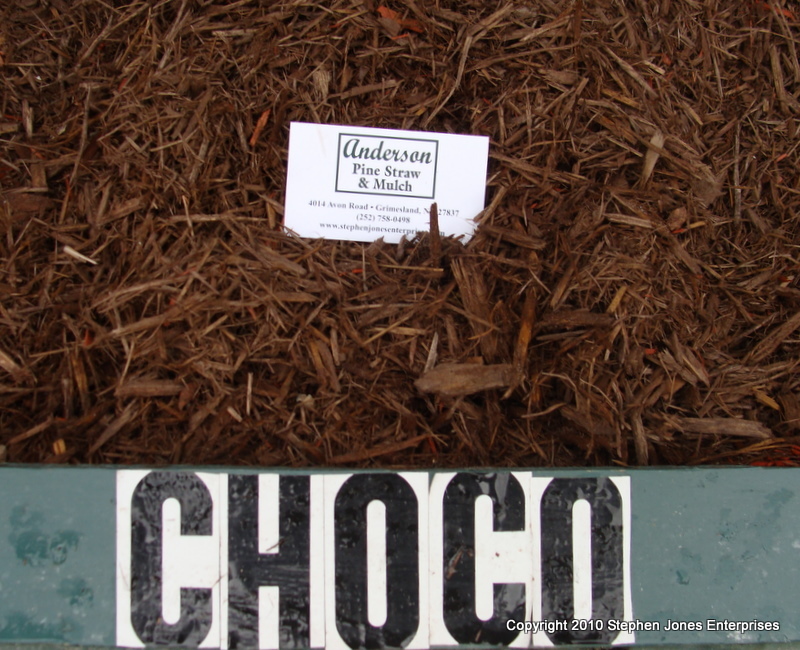 It holds its color for a longer duration than other non-dyed mulches. Composed of cypress, this mulch product is not as moisture retentive as others. Its longevity and uniformity makes this product very popular on sites where curb appeal means everything. 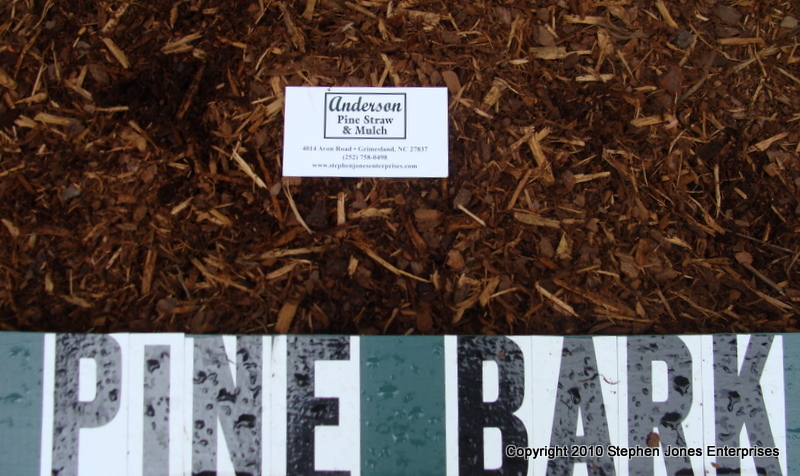 It is very easy to install due to its lightweight and smaller length than our hardwood mulch. In 2009 we switched from a dyed oak product to a dyed cypress product. We found many advantages with the switch. The dyed cypress was found to hold its color longer than the dyed oak and with a smaller shredded product, it was easier to spread. The red color tends to penetrate deeper into the wood of the cypress over the oak and holds its color better. This pure cypress product adds a vibrant color to the base of landscape plantings. 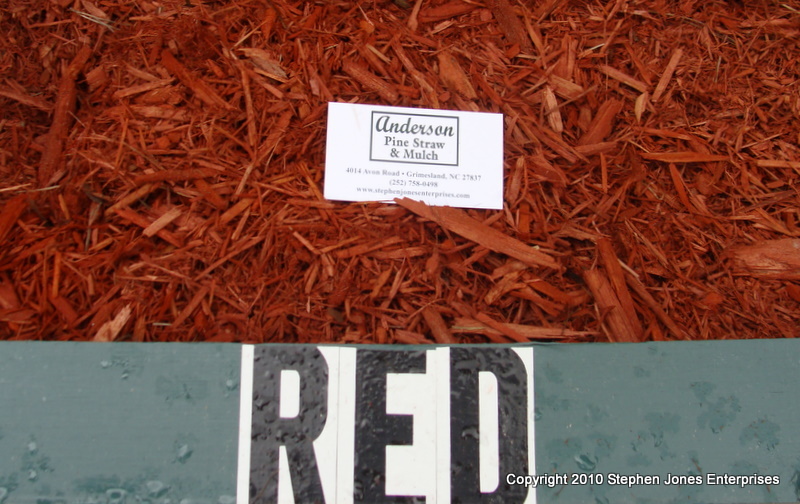 This is a non-toxic dyed mulch. This is a sheet of 11 x 17 inch paper, graduated in 1 inch increments to compare pinestraw lengths. All of our pine straw supplies are kept in dry storage vans or shelters to keep the needles from decaying inside the bales as the bales that accumulate moisture when left outside will tend to decay on the inside of the bale. By far our most popular among both homeowners and high end landscapers. All bales are clean and consistent in size with needles in lengths of up to 16 inches. It has more resin in the needles making it our longest lasting and also our brightest in color. Even though it is our most expensive straw it returns its initial cost difference with the most longevity. This pine straw falls from the Elliottii pine tree, which produces 7-10 inch needles and has more resin in the needles than the loblolly. It is commonly called “Georgia Red” due to its reddish appearance. The color of this straw is typically reddish brown. 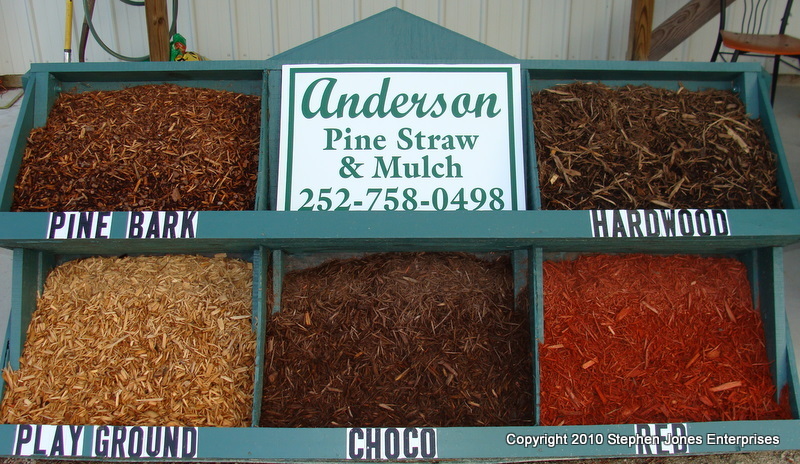 Of the three varieties that we provide the slash pinestraw has medium color, medium needle length, and is our mid-ranged price. 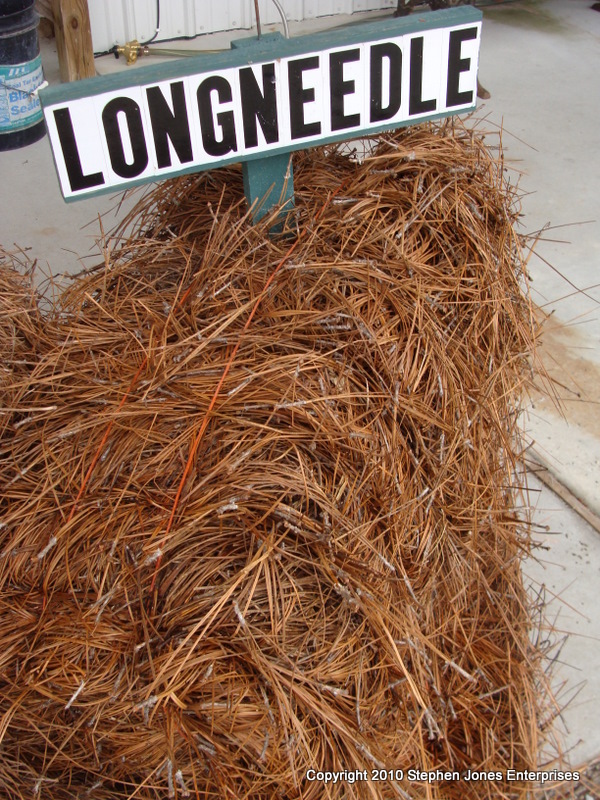 Beware of other competitors who are selling slash pinestraw and calling it long needle, there is a noticeable difference to the trained eye, and you will be paying more for a lesser straw as it does not have the same longevity as the long needle pinestraw. This pinestraw is very popular among landscapers, golf courses, nurseries, and garden centers. The Loblolly pine tree is probably the most common pine tree in the eastern part of North Carolina. The loblolly has the shortest needle of the three varieties that we carry and is considered a short needle straw with a length of 6-8 inches. It has a softer texture than the other varieties and its color is a brownish-orange and spreads very easily. 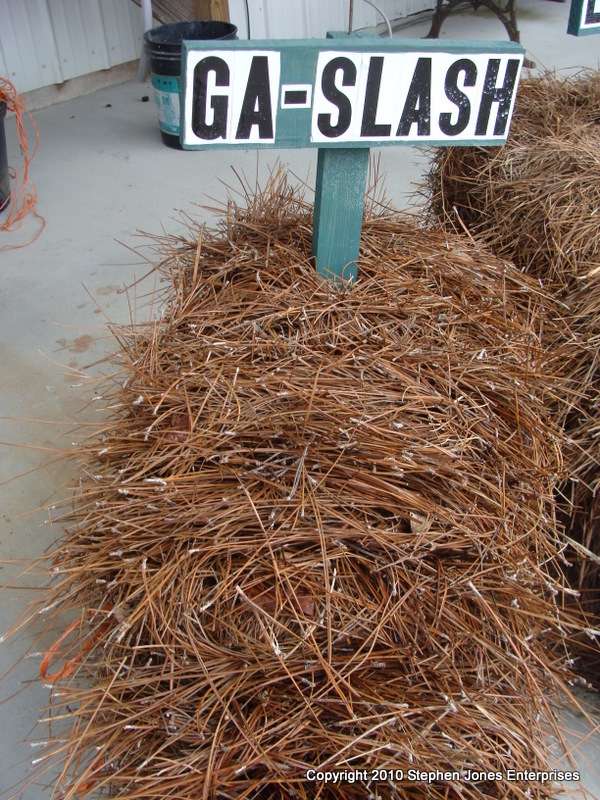 Many customers remark on how soft the texture of this pinestraw is when compared to the slash. It is usually purchased for its ease of installation and its inexpensive cost. 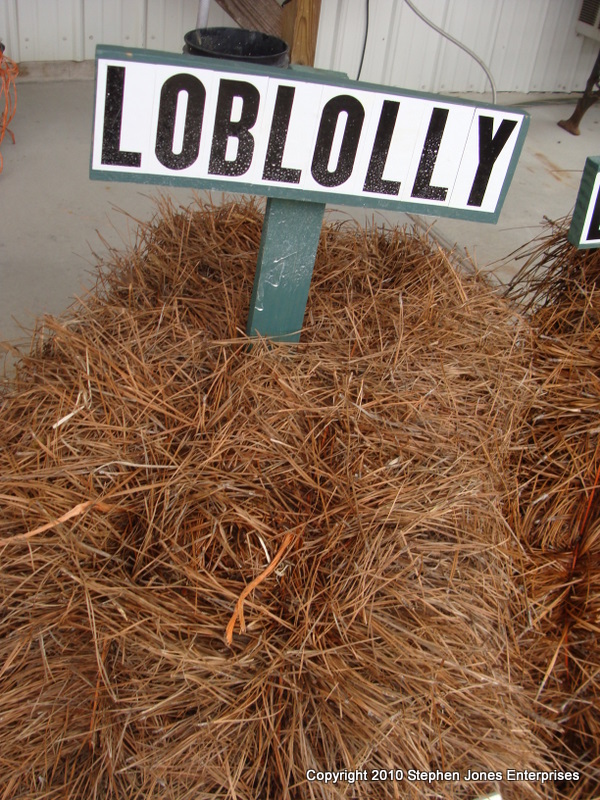 Loblolly pinestraw lays and tucks very well due to its softer and flexible needles. It is also our least expensive bale of pine straw. We sell sandy loam topsoil onsite by 1/2 cubic yard. We sell fill, screened, and mortar sand by 1/2 cubic yard increments. We carry granite stone with grades of UCL base, screenings, 78M, and 57, Rip Rap Class A and B, and granite boulders. Please call for availability prior to ordering. Flagstone Bundles are available in limited quantities and varieties starting in 2011. Please call for availability and special orders before ordering these products.